We held the first concert of the series with fabulous Italian singer Marta Rosa and which is set to happen every month at Moksh, Jhamsikel. The concept behind these series is to put together bands that do not exist, coming up with different and fresh sounds every month and joining international artists with some of the best performers in Kathmandu. For this occasion, the repertoire featured were mostly compositions from our visiting faculty Marta Rosa. 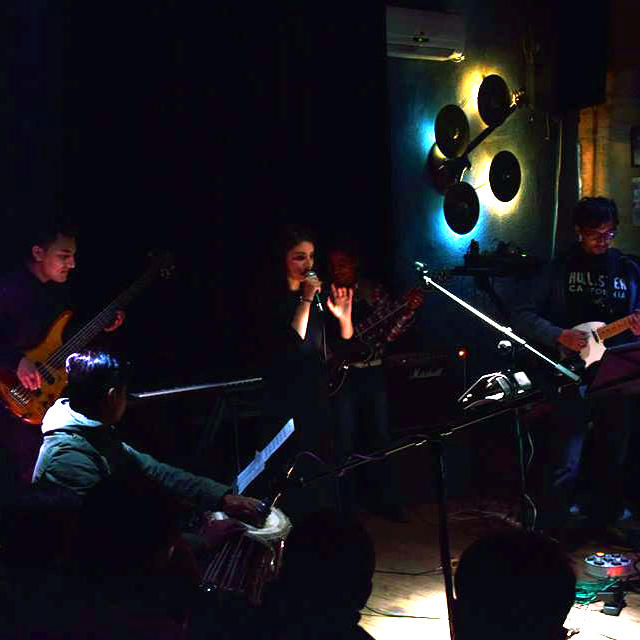 On her second time at our conservatory, she has put together a band with Isu Shrestha on guitar and live electronics, Pratick Baniya on bass guitar, Jagannath Dhaugoda on tabla and Subash Siwa. A solid group that had never really played together before. In fact, that is the reason behind creating these music sessions. There are many musical groups in Kathmandu that have been playing together many years, but we don’t have many events where musicians are just put together ‘impromptu’ and they converse with each other as if they were talking instead of performing something pre-planned from months or years ago. The next Impromptu Music Session is on February, 3rd 2017 at 8pm featuring Mr. Ray Heberer on trombone, our director Mr. Mariano Abello on Saxophone, Rajat Rai on guitar and Kismat Shrestha on drums.